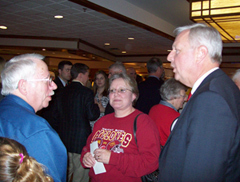 Terry Branstand talks with an Iowans for Tax Relief member. Five men who are running for governor touted their ideas for tax reform during a weekend forum in Des Moines. The candidates addressed about 550 members of Iowans for Tax Relief and the lead-off speaker was Bob Vander Plaats, a Sioux City business consultant. Vander Plaats pledged to shrink the size of state government and “overhaul” state tax policy. Vander Plaats would no longer have local governments, through property taxes, pay for mental health services for the needy and instead have the state pick up the tab. 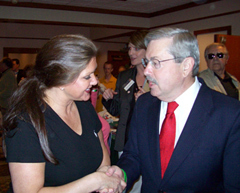 Former Governor Terry Branstad outlined his ideas for reducing the property taxes businesses pay. Branstad also vowed to fight any effort to get rid of the tax credit which allows Iowans to deduct their federal tax bill from their state tax liability. Narcisse told the crowd he’d reduce the state sales tax by three percent and give Iowans a 15 percent income tax rebate which they could use to invest in a small business. Rod Roberts talks with Iowans for Tax Relief members after forum. Eric Cooper, a Libertarian candidate for governor, proposed the most sweeping tax reform. He favors a small state sales tax and, only if necessary, a flat income tax. “If we’re going to ever dig ourselves out of the hole the government’s created for us, the government has to get very much smaller, very quickly,” Cooper said. The fifth and final candidate to speak, Republican State Representative Rod Roberts of Carroll, said to reduce property taxes, it’s time for politicians to consider “redesigning” Iowa’s local governments, too. “In the 21st century we’re going to have to approach the structure of local government and how best to deliver services and how best to pay for them,” Roberts said. Roberts and the other G.O.P. candidates expressed support for the main objective of “Iowans for Tax Relief,” a constitutional amendment which would limit state spending to 99 percent of state tax collections. Culver was in Cedar Rapids Saturday for the opening of the temporary home for the flood-ravaged Czech and Slovak Museum. Iowa Democratic Party officials issued a statement, saying Branstad in particular was “masquerading” as a tax cutter at Saturday’s forum. Click on the following links to hear the “Iowa Taxpayer’s Day” speeches from each candidate; each speech was about eight minutes long.